Having a slow or inconsistent Wi-Fi connection can cause even the most patient of us to eventually groan and grumble. So why not attempt some quick and—mostly—free fixes that may improve your Wi-Fi signal strength? We have compiled a list of fixes that can be done in the span of a few short hours and will make your Wi-Fi signal much stronger. A wireless router’s broadcast channel is one often overlooked setting that can dramatically improve signal performance. Routers can broadcast on a variety of channels and it is best to choose one that is not as crowded. Most routers will support up to 11 distinct channels. As a wireless channel becomes crowded, devices communicating over that channel will start to interfere with each other. So if channel 1 is too crowded while channel 6 is not, switch over to channel 6 and you should notice some improvement.Changing your router’s wireless broadcast channel will depend on manufacturer and model, but generally you should check the wireless settings menu in your router’s admin portal. To get to your router’s admin portal, you will have to type its gateway address into your internet browser. For most routers, the gateway address is either 192.168.1.1 or 192.168.1.1.To find a low-congestion channel, you can use a program to scan the available channels. Two free to use Wi-Fi scanning utilities that you should try are Acrylic WiFi and WiFi Channel Scanner. They will scan for all wireless networks and let you know which channel is the least crowded. Be sure your router is transmitting the latest standard for the best speed and range. If your router is capable of transmitting 802.11ac and you have it set to broadcast 802.11, you are not maximizing your router’s range. The latest Wi-Fi standards are capable of nearly gigabit speeds and take advantage of less over-saturated frequencies. Like changing the wireless channel, changing the standard is typically done in the wireless settings menu of your router’s admin portal.However, please note that moving to a newer Wi-Fi standard may result in some of your older wireless devices such as old mobile phones and wireless network cards not being able to connect to the new network. Many newer routers are dual band however, which means that they can transmit both 2.4 GHz and 5 GHz simultaneously. So if you have a dual-band router you can still support older devices stuck on 2.4 GHz. Router manufacturers often issue firmware updates that can fix critical glitches, exploits, improve signal quality, and more. A good practice is to regularly check your router manufacturer’s Web site for firmware updates. In your router’s admin portal, there may sometimes be a link or button that says, “Check for Updates”. Clicking it will typically make the router check automatically or it will direct you to the manufacturer’s Web page. If you have never checked for firmware updates since you purchased the router, chances are that you may have missed one. 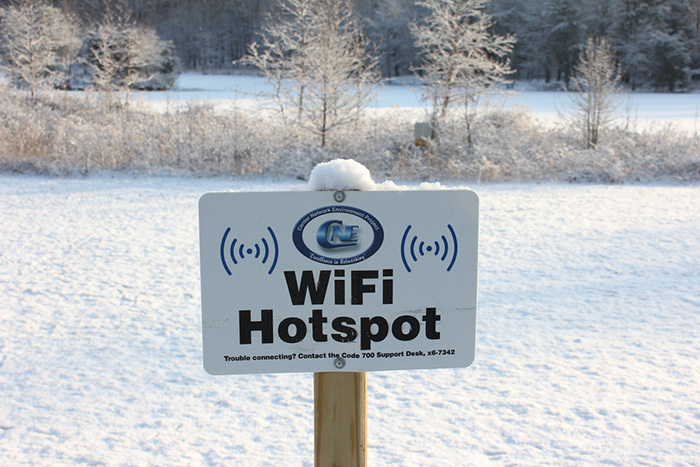 If the methods above have not improved your Wi-Fi™ signal, you should consider moving your router to a better location. Electronics such as microwaves or cordless telephones can cause interference, so it is best to have them far away from a router. To find the ideal location for your router, we suggest that you first create a heat map of your Wi-Fi network to know where coverage is strong and where it is weak. For information on how to create a Wi-Fi heat map for free, see our How to Create Your Own Wi-Fi Heat Map article.Once you have determined where the weaknesses in your Wi-Fi network are, you should move your router to a location that can better service those areas. Generally a router should be placed in a central location and mounted high on a wall or on the ceiling to minimize obstructions. Try to avoid placing the router within several feet of electrical equipment. If finding a centralized location that can cover your entire office area is not possible, then you may need to add access points and extenders. If you have unused wireless routers, you can also increase coverage by using them as range-boosting repeaters.Repeaters and range extenders connect to your wireless router’s network and rebroadcast it. Avoid placing one at the edge of your router’s coverage as the extender will barely get a signal itself. Instead place it somewhere midway between the router and the edge of its coverage. So if you some time and want to optimize your Wi-Fi network’s speed and coverage, the tricks above should give you a nice performance boost. If you know any other quick fixes that can boost WiFi signal performance, do share in the comments below. Photo by woodleywonderworks, taken from Flickr Creative Commons.